Though I finished it a few days before writing this, it was hard to determine what to say exactly about this sophomore novel from Setterfield. On the one hand, it is written well, almost lyrically in spots, but on the other hand the story never captivated me. Part of my ambivalence while reading and upon completing this novel stemmed from its description. It is not a ghost story. I don’t think there is any way to really interpret it as a ghost story other than aspects of it are haunting and that the protagonist is indeed ‘haunted’. I may have been more receptive if I hadn’t started this expecting something quite different. Though titled Bellman & Black, this only concerns the second half of the book, really. The novel is really about Bellman, the protagonist, from a young age until his death. There is the eagerness and vitality of his youth, sexually and professionally, that is perhaps driven by the absence of his father. This youthful drive compels others to pay attention to Bellman, and soon his hard work and vision leads him to industrial success and the start of a family. Upon reaching these heights, Bellman’s world is shattered by the deaths of almost all he holds dear, driving him further into his work, which in the second half involves starting a funeral business that Bellman is inspired to form after a mysterious encounter (perhaps imagined) with a Mr. Black. Bellman’s world becomes completely occupied with his industrious spirit and desire for profit. Forsaking friends and family he uses the business of death to amass funds that drive him into further fears of losing all he has, now to his mysterious and absent ‘partner’ Black. The reality of Bellman’s life (and the intersection of the fantastic in the form of Mr. Black, who is perhaps conjured in Bellman’s mind alone) is symbolized by the dominance throughout the novel of rooks (related to crows). In childhood, Bellman once threw a rock at a rook, which killed it. This event seems to haunt Bellman, and in the fantastic element of the story, it is implied that Mr. Black is an embodiment of the rook, seeking amusement and revenge for what was done to their kind. As the rock traced an arc in the sky leaving a dead bird, so too does Bellman’s life arc to a height only to then drop to inevitable death. These ideas are actually quite good, and Setterfield’s descriptions of rooks are the highlights of the novel. However, the fantasy and the reality never intersect enough to work effectively. The majority of the novel is taken up with the reality of Bellman’s business dealings, and to a lesser extent relationships. The novel thus becomes a historical fiction detailing a man whose life becomes an obsession over business and profit, a combination between “A Christmas Carol” and “Martin Dressler”. This type of novel has been done frequently, and Setterfield doesn’t add anything particularly new to this aspect. Instead she adds the fantastic slant with the crows and their symbolism, never really settling on whether they are in Bellman’s head alone, or an actual paranormal manifestation in the form of Black. 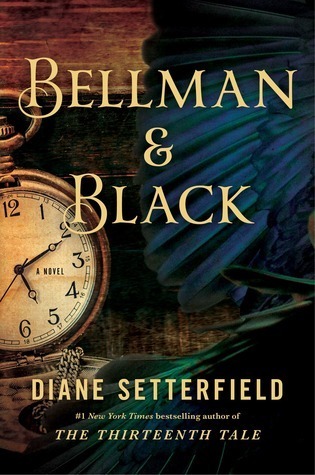 “Bellman & Black” therefore has a lot of promise, and given the popularity of her first novel (which I haven’t read) I’m sure many will adore this book. I think I would have, had it not been marketed the way it was, and if the Black storyline had been introduced much earlier rather than so much space spent on detailing Bellman’s prowess at industry.